The Natural Resources component of UCF’s Landscape & Natural Resources department is committed to management of the University’s natural areas, which make up 56% of the main campus. 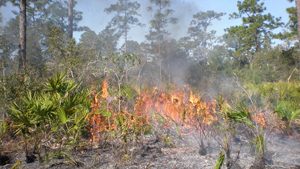 The mission of the land management program, created through Landscape & Natural Resources, is to provide UCF students, faculty, staff, and the greater community of Central Florida a comprehensive environmental and outdoor living laboratory for education, research, recreation, and human interaction with ecosystem functions. Teaching and research conducted within UCF’s natural lands is encouraged. Through site use permits, the protection of the biological resources on campus is accomplished. Please explore the links below to learn more about UCF’s land management program.